Spinach frittata recipes are delicious and you don’t have to be on a low-carb diet to enjoy them! Try our favorite recipe made with einkorn flour and tell us what you think. You can also make a crustless spinach quiche using traditional all-purpose flour. First preheat the oven to 350 degrees. Next you will sauté finely sliced shallots over medium heat until they’re soft and golden. In a separate mixing bowl, whisk together the milk, flour and eggs. Add in your cooked shallots, spinach and bacon, stirring until everything is nicely combined. We’ve included some of our favorite variations in this dish, so don’t be afraid to experiment with your favorite ingredients. This is the perfect dish to serve for Easter brunch, parties or any time of day you prefer. You don’t need to be a gourmet chef and you’ll save a ton of calories by skipping the traditional pie crust! In a medium oven-proof sauté pan, cook bacon over medium high heat until crisp. Move to paper towel to drain. Crumble when cool. Drain the pan and wipe clean. Return 1 Tbsp of the bacon fat back to the pan and reheat. When hot add the sliced shallot and cook until soft and golden brown. Move to a paper towel to drain. Whisk together milk, flour and eggs in separate mixing bowl. 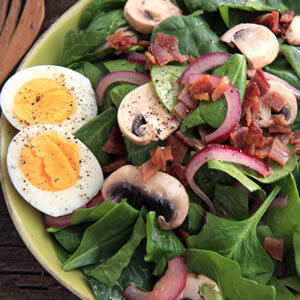 Add shallots, spinach and bacon; combine. Add 1 tsp salt and pepper to taste. Clean the pan one more time and spray with cooking spray. Pour mixture into pan and sprinkle cheese on top. Bake for 30-35 minutes until a knife inserted into the center comes outs clean. Serve immediately and enjoy! Mix and match meats and cheeses to create several different variations of the same dish!